Memories play a very important part in one's life. Creating a photo album means restoring the memories of the most important events of your life forever. Hence, creating the right kind of wedding album can make you relive the most important day of your life even years after your wedding. The market is flooded with various options of wedding albums comprising innovative designs, colors etc. We provide you with some of the interesting and creative options that you can go for. If you are creative, you can go for a homemade album. A homemade album will definitely give a personal touch to your wedding album. Tell a story album can be very interesting. Add photos in the album in the chronological order from the beginning till the end. Add an appropriate caption to each photo. Magazine style album is very similar to a fashion magazine. Rather than pasting one photo on each page, you can create a magazine style album by composing more than one photo on each page. It can be made even more interesting by over lapping one photo over the other and thus giving it a three dimensional look. Different special effects can also be added to this kind of album. For this purpose you can use all the available photos and create a unique album. These are only few options; there are numerous others that you can opt for. Album Cover : It is very important to create an interesting album cover. The cover should be such that it gives a hint to the viewers about what to expect. Give a lot of importance to the quality of the paper used while creating a wedding album because it is going to last for a life time. The paper used in the album should be such that it does not get bent or torn easily. Also, make sure that the quality and color of the picture does not fade with the passing time. Assistance of a photograph expert becomes essential if you want your album to be unique and perfect. The rates of the wedding albums differ as per the innovations, quality of paper used etc. 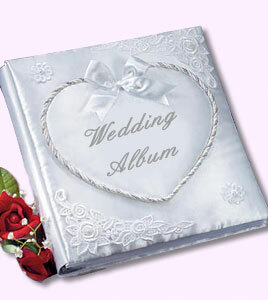 A wedding album is a jewel in the journey of one's life that is treasured and preserved all through the life. So, take interest and make it as exclusive as possible by using your creativity and the various choices available in the market. Thanks for sharing. A self adhesive wedding album is also good. You make layouts and then stick them onto the wedding album which you can buy. Anyway thanks for sharing.